While it may seem strange to suppose that the year 1936 was in any way beneficial to the Jewish people, considering the state of affairs in Nazi Germany, and the dawning of the Arab Revolt in the British Mandate of Palestine, that year did also bring with it the beginning of a relationship that continues to benefit the Jewish people to this day. It was the year when Orde Charles Wingate—Scottish eccentric, military genius, visionary and one of the most passionate Zionists of his day—was assigned to a British Army Intelligence post in the British Mandate of Palestine, a move that would eventually make Wingate a hero of the Yishuv. And yet, while his assistance to the Zionist cause is well-known and appreciated in Israel, the origins of his commitment to the Jewish State are by no means clear, even to his biographers. Critics are apt to dismiss his Zionism with off-handed references to his Old Testament-heavy Christian upbringing or his affinity for the underdog as 'the' reason, but his real motivations are far more complicated. This essay sketches out the complexities that brought about Wingate's Zionism, while attempting to refrain from the amateur psychoanalysis that plagues too many biographies of the man. Before delving into the psyche of the man, it is worth mentioning the effect he continues to have in Israel. Traveling through Komemiyut in Jerusalem, at the intersection of Jabotinsky and David Marcus, one will see Kikar Orde (known also as Kikar Wingate). There are Wingate Streets in Be'er Sheva, Tel Aviv and Herzliya as well. In the Carmel Mountains, just south of Haifa, there is the Yemin Orde Wingate Youth Village, which serves hundreds of disadvantaged, at-risk and immigrant children from around the world. Israel's national sports and health education institute in Netanya is fittingly named Machon Wingate, the Wingate Institute. One might be wondering why so much was named after this man. In his book on the history of the Israeli army, Ze'ev Schiff called Wingate "the single most important influence on the military thinking of the Haganah." While a complete analysis of that influence would constitute an article of its own, Samuel M. Katz put it succinctly. "Wingate had a profound impact on the molding of Israeli military doctrine. Defense, when fighting a numerically superior enemy, meant offense, and offense meant fighting deep inside enemy territory where the opposition was most vulnerable." To this day, that concept remains the core of Israeli military strategy. And with that admittedly abbreviated digest, the focus may turn to the man himself. Beginning with Christopher Sykes' authorized biography of Wingate, entire chapters have been devoted to Wingate's life prior to his years in the Mandate and later distinguished service in restoring Haile Selassie to the throne of Ethiopia and Chindit operations in Burma. While that degree of detail is not possible here, a brief sketch is essential to framing the question of his eventual adherence to Zionism. Orde Charles Wingate was born in Naini Tal, India, in 1903 to parents who were members of the Plymouth Brethren, a Puritan offshoot. He was raised to believe that an individual owed a duty to God, though he would never prove to be a religious man in any regular sense of the term. During his initial military service in the Sudan, the young Wingate wrote in his Letter-Journal to "Serve God not self." Wingate's religious upbringing involved consistent study of the Old Testament. (Later, such study would amaze Jews in the Yishuv who were impressed by Wingate's encyclopedic geographical knowledge of Israel). But during his formative schooling years, including his military schooling, he felt alienated from his family's religion. Indeed, as his lifelong friend Derek Tulloch pointed out, while Wingate was at the Royal Military Academy, Woolwich, he was in the midst of a rebellion against the religion he'd been brought up in, and that turmoil led to his not presenting "a very likable front to his fellow cadets." After graduation from Woolwich as a member of the artillery corps, Wingate sought the advice of his 'Cousin Rex', Sir Reginald Wingate, Sirdar of the Sudan, regarding where he should get assigned. Unsurprisingly, he would find himself in the Sudan, where his native troops would bestow on him the title 'His Worship the Judge' in recognition of his erudition. Perhaps of greatest importance for the purposes of this paper is the fact that prior to leaving for the Sudan, Wingate learned (and displayed a considerable aptitude for) Arabic, the ability that would eventually send him to the Mandate of Palestine, and his destiny. During his stay in Britain after returning from the Sudan, Wingate met and fell in love with the brilliant, though considerably younger, Lorna Paterson, whom he would marry. No analysis of Wingate's life could hope to be adequate without mention of the woman in whom Wingate found his intellectual equal, sounding board, and wife. Lorna Wingate herself became as passionate a Zionist as her husband, continuing to advocate for the Jewish Agency even after his death. Indeed, it was Lorna Wingate who, in response to the utter lack of command-level officers available to Israel in 1948, convinced Ben Dunkelmann, a Canadian Jew, to fight for Israel, castigating him by stating that "Were my husband alive, he would not take no for an answer. He would demand that you go to Palestine and volunteer your services!" Upon the completion of his service in the Sudan, and a fruitless quest for the lost oasis of Zerzura, then-Captain Wingate found himself without an expected appointment to Staff College, which was at the time practically the only means for advancement in the military. After confronting the Chief of the Imperial General Staff with his complaint (and a copy of a published report on his quest for Zerzura), Wingate found himself given a post as an Intelligence Officer in Haifa. In the fall of 1936, Wingate arrived in Haifa, an Intelligence Officer chosen for that role in large part due to his fluent Arabic. Up to this point in his life, he'd had extremely limited contact with Jews, and virtually no knowledge of or affinity for Jewish issues. As he would later express it, "In 1938 in spite of my natural sympathy with the Arabs and my understanding of their position I became during my official studies convinced that the Imperial, Jewish, and Arab interests all lay in in [sic] one direction." Had Wingate's interest been so limited to utilizing the Yishuv as war loomed, the matter might be settled there. However, Wingate did not merely see the Jews as a resource to be used – however essential they may be as a tool of British policy. He became such a committed Zionist himself that it never failed to amaze the leaders of the Yishuv. But what actually led to that conviction? It is not only his critics who point to his early Bible-intensive education as a primary source. Yigal Allon referred to Wingate's "extraordinary Zionist ardour inspired by the Bible…" while Shabtai Teveth cited Haganah archives as describing Wingate as "an eccentric, a genius, a man more religious than rational, given to great pathos, a firm believer in the Bible, and fired with a sense of the special mission of the Jewish people." While describing Wingate as having a genius for "grasping and using new mechanical techniques," Lowell Thomas did not argue against the conception that Wingate was also "a Scripture-reading crusader." However, the complexity that formed the foundation for Wingate's remarkable genius does not readily coincide with the notion that his Zionism was simply based upon the Bible. As Luigi Rossetto wrote, "Wingate had one quality which stands out above all others and that was his ability to examine the situation objectively and to draw on that part of his experience which applied while rejecting that which did not." One side effect of Wingate's unhappy experience at Woolwich was to incline him to take sides, invariably, with the underdog. He never forgot the sensation of all men siding against him. . . . The discovery, however, of this quasi-biblical cause in his life, which opened before him just at a time when he was expecting a cause to appear – to justify his existence and fulfil his destiny – explains his decision to take up the challenge. Tulloch set forth three components that, in his opinion, led Wingate to embrace the Zionist cause. In addition to the "quasi-biblical" nature of the cause, Tulloch added Wingate's inclination to side with the weaker party, and Wingate's need at the time for a cause in which his destiny could be attained. While the Biblical aspect is intriguing on its own accord, the latter two components call for further examination. From his early years, Wingate felt himself to be up against significant odds, and that this self-perception played a role in his world view is scarcely questionable. While serving in Ethiopia after being banished from the Mandate, he exhorted that "The right of the individual to liberty of conscience, the right of the small nation to a just decision at the tribunal of nations, these are the causes for which we fight." However, it is by no means a simple matter to state that Wingate's affinity for the weaker side compelled him to the cause of the Yishuv, much less Zionism itself. Again, Tulloch provided the key element. "Had he found the Arabs were being oppressed and considered their cause to be just, he might well have directed his energies on their behalf." Far from Wingate's motivation being a case of perception feeding his underlying inclination for an underdog, it was through his intensive study of "the history of Palestine and the yishuv" that he would emerge as a committed Zionist. We are in for a war sooner or later – no hope now of avoiding that after the Abyssinian fiasco – for pitys [sic] sake let us do something just and honourable before it comes. Let us redeem our promises to Jewry and shame the devil of Nazism, Fascism, and our own prejudices. The preceding is particularly illuminating for two reasons. First, in contrast to his official and semi-official communications, Wingate's letters to his cousin were not intended to be left for posterity. Second, and perhaps more importantly, is the global reach of the forces Wingate presented as arrayed against the Jews. The rising powers of Nazism and Fascism, coupled with his perception of British prejudice against the Jews represented considerable opponents indeed. Coupled with this was his deeply held conviction that Islam itself in fact cared "little for the Arabs of Palestine" and "would be prepared to accept a fait accompli." However one may wish to question the accuracy of Wingate's view on the matter, the fact is that his view of the Jews as not only the weaker party, but deserving of justice on their own merits, is clear. Indeed, he would later frame the issue by praying that, "God give it to us to slay the enemies of the Jews, for the enemies of the Jews are the enemies of all mankind." Wingate's identification of the Yishuv (and Jewry in general) as the weaker side was made on the basis of his direct observations and study of the situation, including widespread, and indeed institutionalized, British antipathy towards the Jews in the Mandate. When combined with the innate justice of the Zionist Dream, it may be said that the Jews became in a sense the underdog incarnate for Wingate. And yet the matter cannot rest there. Though Wingate would find himself drawn to another powerless individual in Haile Selassie, when he later found fame and glory in Burma there is no evidence of a similar attachment to the downtrodden Burmese. And so we must turn to the third part of Tulloch's analysis, Wingate's need for a destiny. As previously stated, Derek Tulloch identified the components that comprised Wingate's need for destiny, a driving need to justify his existence and a means to fulfill the destiny demanded by that justification. As Sykes put it, "He was convinced he was a dedicated being, though dedicated to what he did not know, and he lived in continual fear that he never would know." Rex King-Clark, who served under Wingate in the Special Night Squads, was of the belief that, "it seems to me that his destiny, in truth, was to burn himself out for a cause – even, with Scottish perverseness, for a lost cause." In combining the need to attain one's destiny with the will to act on it, Wingate may firmly be linked to Theodore Herzl's immortal declaration that "if you will it, it is no dream." As Wingate put it to a prominent Jew, "I count it as my privilege to help you fight your battle. To that purpose I want to devote my life." Nor was Wingate's pondering a shallow or single-track thing. 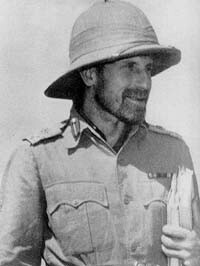 Colonel Philip Cochrane, co-leader of the First Air Commando, who supplied Wingate's Chindits with transportation and supplies during the second Chindit expedition, explained that, "He made you feel that here was a man who could look into the future and tell what was going to happen tomorrow." In short, Wingate found his destiny in Zionism at just the time he needed it most, and based on many of the same factual reasons that he was able to see the Jews as worthy underdogs. It is no secret that to the end of his days, he firmly believed that his destiny was to see a Jewish state arise, and that he would lead it in its battle for existence. Even though he died in a plane crash in Burma on a clear night in March of 1944, it can easily be argued that his destiny continued to be attained when the Haganah utilized his military doctrines in 1948. The sub-heading for this section is somewhat misleading. Indeed, if this paper has demonstrated anything, it is that the complexity of Wingate's psyche makes it utterly impossible to state a conclusion with certainty as to why he truly became a Zionist. His mother-in-law, Alice Ivy Hay, was convinced that his only reason was that he believed it right for the Jews to have a homeland, and that that would bring about the fulfillment of biblical prophecies. Rex King-Clark highlighted Wingate's need to find destiny in a cause. Still others have stressed his affinity for the weak and the powerless. In the end, one must turn once more to the observation of Derek Tulloch. After appreciating the complexity of a man such as Wingate, the combination of various facets of his mind must be found to have led to his passionate Zionism. Wingate identified the Jews as the underdog, was convinced of the essential rightness of the Zionist cause, found it supported by the Bible, and foresaw his own destiny intermingled with the Jewish State. One cannot eliminate any link in that chain and still hope to even begin to comprehend why Wingate embraced Zionism. And yet, by attempting to encompass the totality of Wingate's Zionism one may indeed begin to understand the multifaceted and deep conviction that Wingate felt, despite the knowledge that a precise and limited answer isn't possible. Aaron Eitan Meyer recently received his Juris Doctor degree from Touro Law Center, and is currently assistant director of the Legal Project at the Middle East Forum, legal correspondent to the Terror Finance Blog, and a member of the Association for the Study of the Middle East and Africa. His interest in Wingate began while he was an undergraduate studying Middle East Politics and History, and has led to over six years of research on Wingate's life and work. He maintains Orde Wingate Remembrance Society groups on popular networking sites, such as Facebook, MySpace, and Friendster. Ze'ev Schiff, A History of Israel's Army (New York: MacMillan, 1985), p. 13. Samuel M. Katz, The Elite (New York: Pocket Books, 1992), p. 12. Christopher Sykes, Orde Wingate (Cleveland and New York: The World Publishing Company, 1959). Orde Charles Wingate, Letter-Journal entry dated April 12, 1931. This and other unpublished papers cited herein are part of the Wingate Archive of the Steve Forbes Churchill Collection (WA), which were generously made available to the author. Even Teddy Kollek, who had limited direct experience with Wingate, recalled Wingate's intimate knowledge of the land. Teddy Kollek, For Jerusalem (New York: Random House, 1978), p. 35. Major-General Derek Tulloch, Wingate in Peace and War (London: Futura Publications Limited, 1972), p. 20. W. G. Burchett, Wingate Adventure (Melbourne: F.W. Cheshire.Pty. Ltd., 1944), p. 49. For an excellent article on Wingate's Sudanese service, see Simon Anglim, "Orde Wingate in the Sudan – Formative Experiences of the Chindit Commander," RUSI Journal, Vol. 148, No. 3 (June 2003), p. 96. Ben Dunkelmann, Dual Allegiance (New York: Crown Publishers, 1976), p. 153. Even Wing-Commander Ritchie, who filed a Report calling for Wingate's banishment from the region, noted that "He is an exceptional linguist." Both the Report and Ritchie's typewritten notes on file, WA. Letter, Orde Charles Wingate to Wing-Commander Ritchie dated June 27, 1939, p. 12. WA. Yigal Allon, The Making of Israel's Army (New York: Universe Books, 1970), p. 9. Shabtai Teveth, Moshe Dayan: The Soldier, the Man, the Legend (Boston: Houghton Mifflin, 1972), p. 100. Lowell Thomas, Back to Mandalay (New York: Greystone Press, 1951), p. 71. Luigi Rossetto, Major-General Orde Charles Wingate and the Development of Long-Range Penetration (Kansas: Sunflower Press, 1982), p. xvi. Tulloch, Wingate in Peace and War, pp. 45-46. David Shirreff, Barefoot and Bandoliers: Wingate, Sanford, the Patriots and the Part They Played in the Liberation of Ethiopia (New York: Radcliffe Press, 1995), p. 181. Michael B. Oren, "Orde Wingate: Friend Under Fire," Azure, No. 10 (Winter 5761/2001), p. 38. WA. Dated January 12, 1937, the letter was written well before Wingate became intimate with the leadership of the Yishuv. Sykes, Orde Wingate, p. 167. Rex King-Clark, Free for a Blast (London: Grenville Publishing Co. Ltd., 1988), p. 204. Tulloch, Wingate in Peace and War, p. 46. Thomas, Back to Mandalay, pp. 79-80. Alice Ivy Hay, There Was a Man of Genius (London: Neville Spearman Ltd., 1963), p. 64.